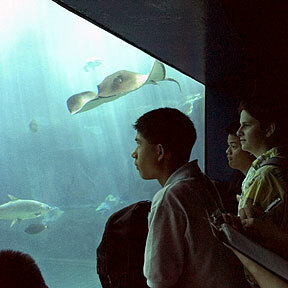 UNDERWATER EDUCATION: Damien Memorial School biology honor students Colin Honeker, 13; Sean Shimuzu, 14; Scott Mailheau, 15; and Kervin Apostol, 14, looked on as their teacher, Jill Sarchet, swam with the rays yesterday at Sea Life Park. The vote to close the site at Waimanalo Gulch by 2008 upsets the mayor. The head of state Civil Defense acknowledges that mass evacuation procedures need work. The luxury shoemaker expands into the competitive world of men's and women's apparel. Jennifer Rosales is one of the best reasons to tune in to this week's LPGA event. This is the smallest increase requested by the state's largest insurer since 1997. The city auditor has found questionable practices and a lack of accountability in awarding of personal services contracts.